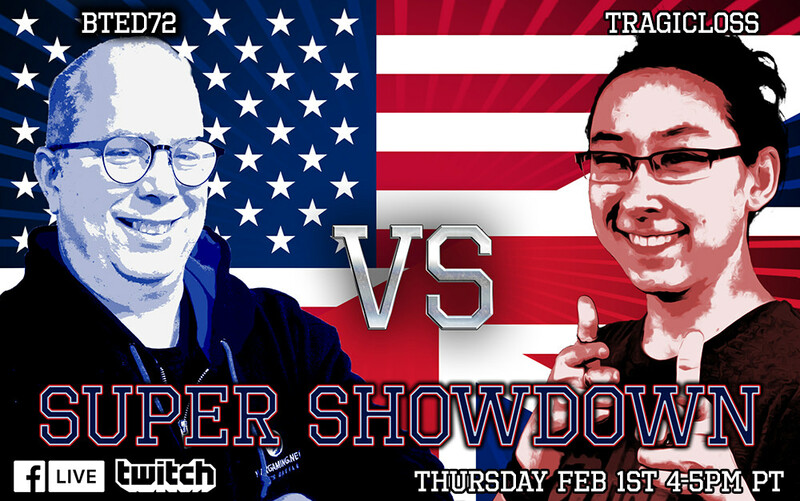 This upcoming Thursday 02/01/18, Bted72 and TragicLoss will be duking it out in the skies to find out who is superior in World of Warplanes! Leading up to the event, we want to hear from you on our Twitter or Facebook pages to see who will win. Those who have chosen the winner of the event will be entered into a random drawing the following day for a chance to win a *Steel Series Arctis 5 Headset! We have 2 headsets to give away this time so we will choose 1 winner each on Facebook and Twitter! **We will also be choosing a runner-up for both Facebook and Twitter that will receive the TeamU.K. Premium Plane bundle! From now until 02/01/18 at 04:00PM PST, please visit either our Facebook or Twitter and let us know who will win! When leaving a comment, please make sure to include your in-game name or else your submission will not be counted! * Physical Prizes are only available to those residing in the continental U.S.
** Winners may only win one prize. NO PURCHASE OR PAYMENT OF ANY KIND IS NECESSARY TO ENTER OR WIN ANY WARGAMING AMERICA INC. SWEEPSTAKES. A PURCHASE WILL NOT IMPROVE YOUR CHANCES OF WINNING. THIS SWEEPSTAKES IS VOID WHERE PROHIBITED BY LAW. THIS SWEEPSTAKES IS OPEN ONLY TO INDIVIDUALS (1) WHO ARE RESIDENTS OF A JURISDICTION WHICH DOES NOT PROHIBIT THE CONDUCT OF, OR THEIR PARTICIPATION IN, THIS SWEEPSTAKES, AND (2) WHO HAVE REACHED THE AGE OF MAJORITY IN THEIR JURISDICTION OF RESIDENCE AT THE TIME OF ENTRY, EXCEPT THAT RESIDENTS OF THE UNITED STATES MUST BE 18 YEARS OF AGE OR OLDER,OR OBTAIN THE PRIOR WRITTEN CONSENT OF A PARENT OR LEGAL GUARDIAN. PARTICIPANTS MUST ALSO MEET THE OTHER ELIGIBILITY REQUIREMENTS SET FORTH IN SECTION 4 BELOW. PRIOR TO RECEIVING ANY PRIZE OR AWARD WORTH MORE THAN $500 IN THIS SWEEPSTAKES (EXCEPT A PRIZE OF IN-GAME CURRENCY), WINNERS ARE REQUIRED TO SUBMIT A COMPLETED W9 FORM AND CERTAIN OTHER PAPERWORK DETAILED BELOW. WINNERS MUST PAY SHIPPING AND HANDLING COSTS AND ANY EXPORT FEES NECESSARY TO TRANSMIT AWARDS TO RESIDENTS OUTSIDE OF THE CONTINENTAL UNITED STATES. YOUR PARTICIPATION IN THIS SWEEPSTAKES REQUIRES YOU TO ACCEPT THE END USER LICENSE AGREEMENT: WORLD OF WARPLANES. IF YOU DO NOT AGREE TO THE TERMS OF THE END USER LICENSE AGREEMENT, YOU MAY NOT PARTICIPATE IN THE SWEEPSTAKES AND MAY NOT CONTINUE USING AND/OR PLAYING WORLD OF WARPLANES (AS SPECIFIED IN OUR DETAILED RULES APPLICABLE TO THE SPECIFIC SWEEPSTAKES (“DETAILED RULES”)). This sweepstakes (the “Sweepstakes”) is sponsored by Wargaming America, Inc. (the “Sponsor”), PO Box 8250, Emeryville, CA 94662. ENTRIES WILL BE ACCEPTED ONLY DURING THE ENTRY PERIOD IDENTIFIED IN OUR DETAILED RULES (the “Entry Period”).In these Official Rules and Detailed Rules, all times are Pacific times in the USA. Participation in this Sweepstakes is open only to individuals who enter in accordance with Section 5 of these Rules and provide all other eligibility requirements listed in the Detailed Rules. Notwithstanding the foregoing, the following are NOT ELIGIBLE to participate in this Sweepstakes: (i) employees, officers, directors and agents of Sponsor and/or Sponsor’s licensees (the “Sponsor Agents”); (ii) parents, spouses, children, brothers and sisters of Sponsor Agents; and (iii) individuals living in the same household as Sponsor Agents. Each Entrant is responsible for providing accurate information as to his/her name, age, residential mailing address, email address and phone number. Individuals that provide information reasonably determined by Sponsor (in its sole discretion) to be incomplete, false or deceptive, will be ineligible to participate or (if they have already participated) to win the Sweepstakes. Each entry received by one or more of the permissible entry methods will remain in a prize eligible pool until the end of the Sweepstakes. From this pool the Sponsor will select winners of Prizes on the dates indicated in the Detailed Rules. Winners will be notified by the method identified in the Detailed Rules. The potential Prize winner may be required to sign the following documents (the “Prize Claim Documents”) and return them via facsimile or email (by .pdf file attachment) within five (5) days of attempted notification (and subsequently return the original, unmodified, executed documents by mail to Sponsor’s address set forth above) : (i) a W9 tax form; (ii) an Affidavit of Eligibility and Liability Waiver; and (iii) where lawful, a Personal Release. Sponsor reserves the right to substitute prizes for a less valuable prize upon the request of the participant. If the potential Prize winner is a USA resident under 18 years of age (if applicable) (or under the age of majority in his/her state of residence), the Prize Claim Documents must be signed by the potential Prize winner’s parent or legal guardian. If the Prize Claim Documents sent to the potential Prize winner by any means are returned as undeliverable, or if the potential Prize winner fails or refuses to properly sign and return all Prize Claim Documents within the above-stated time period, or if the potential Prize winner (and/or his/her entry content) is determined by Sponsor (in Sponsor’s sole discretion) to be ineligible or not in compliance with these Official Rules, the potential Prize winner will be disqualified and alternative entry will be selected as the potential Prize winner. In the event that a randomly-selected winner declines his or her prize for any reason, including to accept a prize of lesser value, the Sponsor may select any entry from the Sweepstakes in its sole discretion, (each an “Alternative Entrant”) and offer the declined prize to that Alternative Entrant, in each case in Sponsor’s sole discretion. At the end of the Sweepstakes, in Sponsor’s sole discretion, all Entry-related materials may remain posted and available for viewing on Sponsor’s website. If required, Entrant hereby grants to Sponsor a perpetual, irrevocable license to use and display the contents of any entry materials for commercial or non-commercial purposes. Entrant grants Sponsor and its partners the right to use his or her names and certain personal information they communicate to Sponsor or its partners in Sponsor’s business and marketing efforts. Specifically, by entering this Sweepstakes, each entrant grants to Sponsor and its licensees (if any) the irrevocable, perpetual, royalty-free, non-exclusive, transferable and sublicenseable right and license to use, display, copy, edit, modify, create derivative works of, publish, distribute and otherwise exploit the content of, and elements embodied in, his/her entries in any and all media, including but not limited to digital and electronic media, audio and audiovisual media (whether now existing or hereafter devised), in any language, throughout the world, in any broadcast outlet and in any manner, for trade, advertising, promotional, commercial, or any other purposes without further approval or consideration. By entering this Sweepstakes, each entrant grants Sponsor and its licensees the right to use the Entrant’s name, image, likeness, voice, photograph, statements and/or Prize information, and/or any portion of any of the foregoing, for promotional, advertising and/or publicity purposes in any media, now or hereafter known, throughout the world and in perpetuity, without compensation or notice to, or further consent of, the Entrant, to the extent permitted by law. By entering this Sweepstakes, each entrant, on behalf of himself/herself and his/her heirs, successors, assigns, agents and representatives, and without further compensation of any kind, waives and releases the Sponsor Agents, and each of their successor and assigns, from any and all claims that he/she may now or hereafter have in any jurisdiction based on “moral rights” or unfair competition with respect to Sponsor’s and/or Sponsor’s licensees’ exploitation of Entries or entry materials, and each entrant agrees not to instigate, support, maintain, or authorize any action, claim, or lawsuit against any Sponsor Agents, any of their heirs, successors, assigns, agents and representatives, or any other person, in connection with this Sweepstakes, the award, acceptance, possession, use or misuse of the Prize and/or on the grounds that any use of any user-generated content, or any derivative works thereof, infringes or violates any rights of entrant therein. None of the Sponsor Agents shall have any obligation, responsibility or liability with respect to: (i) notifications, communications or materials sent from an entrant to Sponsor or from Sponsor to an entrant, that are lost, late, misdirected, garbled, inaccurate, incomplete, illegible, unintelligible, damaged or otherwise not received by the intended recipient, in whole or in part, due to computer, post office or technical error of any kind, (ii) telephone, electronic, hardware, software, network, Internet or computer malfunctions, failures or difficulties, (iii) power-related or weather-related events of any kind, and/or to any events not under Sponsor’s direct control, (iv) entries or other communications from entrants that contain inaccurate information or do not comply with these Official Rules, (v) errors, omissions, interruptions, deletions, defects, delays in operation or transmissions, theft, destruction, unauthorized access or alterations by entrant or third parties, and/or (vi) any damage to entrant’s computer system that occurs in connection with accessing Sponsor’s Website and/or submitting entry materials. BY ENTERING THE SWEEPSTAKES, EACH ENTRANT, ON BEHALF OF HIMSELF/HERSELF AND HIS/HER HEIRS, SUCCESSORS, ASSIGNS, AGENTS AND REPRESENTATIVES, RELEASES EACH SPONSOR AGENT, AND EACH OF THEIR RESPECTIVE SUCCESSORS AND ASSIGNS, FROM AND OF ANY AND ALL CLAIMS AND DAMAGES ARISING OUT OF THEIR PARTICIPATION AND/OR ENTRY IN THIS SWEEPSTAKES AND/OR THE AWARD, ACCEPTANCE, POSSESSION, USE OR MISUSE OF THE PRIZE AWARDED IN THIS SWEEPSTAKES. Waiver of California Civil Code Section 1542. Further, entrants are advised that California Civil Code § 1542 provides that: A GENERAL RELEASE DOES NOT EXTEND TO CLAIMS WHICH THE CREDITOR DOES NOT KNOW OR SUSPECT TO EXIST IN HIS FAVOR AT THE TIME OF EXECUTING THE RELEASE, WHICH IF KNOWN BY HIM MUST HAVE MATERIALLY AFFECTED HIS SETTLEMENT WITH THE DEBTOR. By entering this Sweepstakes, each entrant, on behalf of himself/herself and his/her heirs, successors, assigns, agents and representatives, acknowledges that he/she understands the significance and consequences of California Civil Code § 1542 and, to the extent it may be applicable, elects to waive the benefits of its provisions, with the intent that this release and waiver of liability in these Sweepstakes Rules shall include claims known or unknown, and unknown and unsuspected. ANY ATTEMPT TO DELIBERATELY DAMAGE SPONSOR’S WEBSITE OR ANY OF SPONSOR’S GAMES (OR ANY PART OF EITHER) OR UNDERMINE THE OPERATION OF THIS SWEEPSTAKES MAY BE A VIOLATION OF CRIMINAL AND CIVIL LAWS. SHOULD ANY SUCH ATTEMPT BE MADE, SPONSOR AND ITS LICENSEES (IF ANY) RESERVE THE RIGHT TO SEEK DAMAGES AND ANY OTHER AVAILABLE REMEDIES FROM ANY SUCH PERSON(S) RESPONSIBLE FOR ANY SUCH ATTEMPT TO THE FULLEST EXTENT PERMITTED BY LAW. EACH ENTRANT (OR, IF THE ENTRANT IS NOT OF AGE OF MAJORITY IN HIS/HER STATE OF RESIDENCE, THE LEGAL GUARDIANS THEREOF) AGREES TO INDEMNIFY AND HOLD HARMLESS THE SPONSOR AGENTS FROM AND AGAINST ANY AND ALL CLAIMS, LOSSES, DAMAGES AND/OR LIABILITIES (INCLUDING REASONABLE ATTORNEYS' FEES AND EXPENSES) THAT MAY BE ASSERTED AGAINST OR INCURRED BY ANY OF THEM AT ANY TIME, IN CONNECTION WITH ENTRANT’S ENTRY MATERIALS, OR THE USE THEREOF, AND/OR BY ENTRANT’S BREACHES OF ANY REPRESENTATION, WARRANTY OR COVENANTS ASSOCIATED WITH THIS SWEEPSTAKES. To the extent permitted or required by law, the Prize winner(s)’ name, city and state of residence may be obtained by sending a self-addressed, stamped envelope, sixty (60) days after the announcement of the Prize winner, to: PO Box 8250, Emeryville, CA 94662. Please specify “ATTN: WINNER REQUEST: [Title] SWEEPSTAKES” on the envelope. Only one request per envelope. Such information will be available only for one (1) year after the award of the Prize. BY ENTERING, ALL ENTRANTS AGREE TO BE BOUND BY THE DECISIONS OF SPONSOR, IN CONNECTION WITH THIS SWEEPSTAKES. All taxes, fees and surcharges on the Prize are the sole responsibility of the Prize winner. In the event that the selected winner of the Prize is ineligible or refuses the Prize, the Prize will be forfeited and Sponsor, in its sole discretion, may choose whether to award the Prize to another entrant in the Sweepstakes. Good luck! Never heard of these names before. Did they play before 2.0? Or just recently joined after? Watched the previous showdown as they call it. Looks to me these are just 1v1s for the wargaming staff only. Would be nice if you guys hosted a similar event but instead invite the 2.0 players and old veterans for some pvp fun. Meh. Oh well. Edit: oh uh, as for who I think will win - I have no clue how good these guys are since I haven't seen them play before. So I'd say they both have an equal chance of taking either one out. But it seems I do have to choose one so hmm... TragicLoss? I guess? Edited by ArrowZ_, 30 January 2018 - 12:22 AM. I've reported your 'RULES' for being all caps. Edited by ArrowZ_, 30 January 2018 - 12:48 AM. I've been playing Wargaming Games for around 5 years. I played before 2.0 for a while. If you watched the previous showdown I was the one that wasn't MeatheadMilitia. I can consider doing a community version in the future! If you'd like to see how well either of us play on a normal day, join Bted72 on Twitch.tv/wargaming. You can also look through some of the past broadcasts to see our skills if you'd like! WOW, 2 admins in 1 post the same day, since both should see this, how bout a 1.4 version also, along with the 2.0 thingy? I thought it said super shutdown. Please join me tomorrow at 11:30 am on both Twitch.tv/wargaming and/or WoWP Facebook page 11 AM as we will discuss the event further. Will have NEWS about some twists and turns for the upcoming SHOWDOWN. Yeah....gotta go with Tragic..she at least played 6 Beta battles versus 1. Maybe not as many 1.0-1.9 as Ted, but she has at least 1 Ace medal...Yup...TL for the win! You fal in love with 2.0? I vote for Bted, I don't know either, but nobody at WG knows how to play this game, even being an admin and not actually part of WG is close enough. Don't touch Persha, whatever they have may be contagious. Unfortunately, we cannot ship outside the continental US. We just hit the trifecta! Three admins in one thread.. WOOHOO! Are they going to be flying the same planes or do they get to pick? And is it the best 2 out of 3? I guess Bted is talking about this now on his stream but I'll have to catch it later. Regardless, excited to see the match up!